We live in a world which no longer questions itself, which lives from one day to another managing successive crises and struggling to brace itself for new ones, without knowing where it is going and without trying to plan the itinerary. And everything important in our lives - livelihood, human bonds, partnerships, neighbourhood, goals worth pursuing and dangers to avoid - feels transient, precarious, vulnerable, insecure, uncertain, risky. Is there a connection between the shape of the world we inhabit and the way we live our lives? Exploring that connection, and finding out just how close it is, is the main concern of this book. What is at stake in this inquiry is the possibility of re-building the"'private/public" space, where private troubles and public issues meet and where citizens engage in dialogue in order to govern themselves. Individual liberty can only be a product of collective work, it can only be collectively secured and guaranteed. And yet today we are moving towards a privatization of the means to secure individual liberty. If seen as a therapy for the present ills, this is bound to produce effects of a most sinister kind. The act of translating private troubles into public issues is in danger of falling into disuse and being forgotten. The argument of this book is that making the translation possible again is an urgent and vital imperative for the renewal of politics today. This new book by Zygmunt Bauman - one of the most original and creative thinkers of our time - will be of particular interest to students of sociology, politics and social and political theory. Zygmunt Bauman 1925-2017) was Emeritus Professor of Sociology at the Universities of Leeds and Warsaw. He was awarded the Theodor W. Adorno Prize for 1998. 1. In Search of Public Space. 2. In Search of Agency. Excursus 1: Ideology in the Postmodern World. Excursus. Excursus 2: Tradition and Autonomy in the Postmodern World. Excursus. Excursus 3: Postmodernity and Moral and Cultural Crisis. 3. In Search of Vision. * A major new book by Zygmunt Bauman - one of the most original and creative social thinkers writing today. 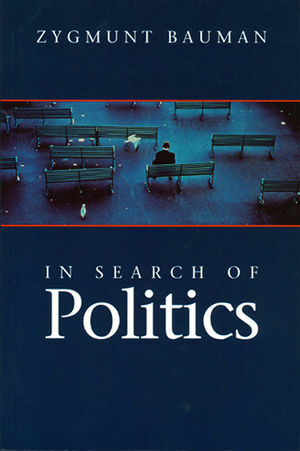 * Bauman brings his distinctive approach to bear on a theme which he has not previously addressed in detail: the changing nature of politics in contemporary societies. * He develops an original and provocative argument about the decline of the public realm and the need for its renewal.